Sunday March 19th 1899 I was busy about the house most of the forenoon Callie was up a little while. I read and wrote in the afternoon. There is an ugly March wind blowing. Will spent the entire day reading. Monday March 20th 1899 Weather still cold. I did not feel well so did not attempt to do much. Will churned for me and I baked bread. I began a rug in the evening. 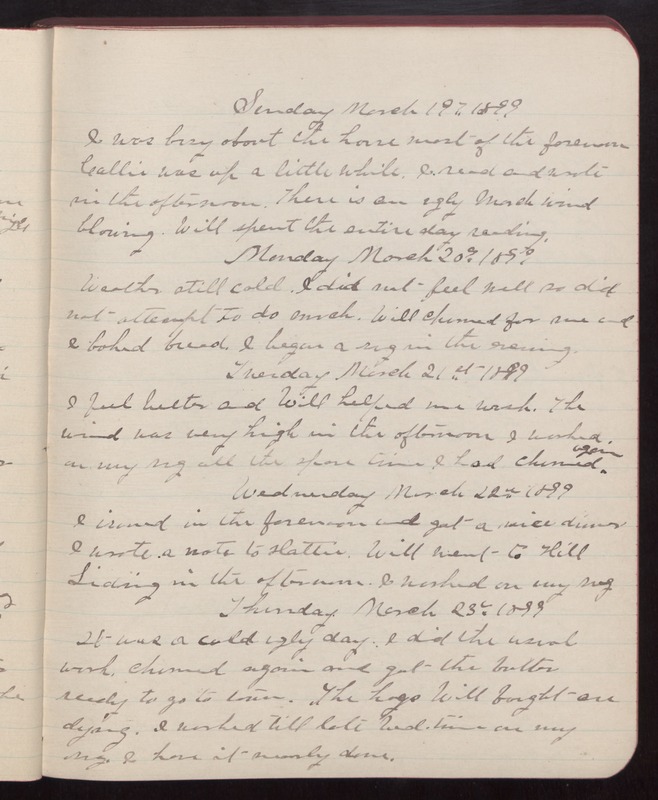 Tuesday March 21st 1899 I feel better and Will helped me wash. The wind was very high in the afternoon I worked on my rug all the spare time I had. Churned again. Wednesday March 22nd 1899 I ironed in the forenoon and got a nice dinner I wrote a note to Hattie. Will went to Hill Siding in the afternoon. I worked on my rug Thursday March 23d 1899 It was a cold ugly day. I did the usual work. Churned again and got the butter ready to go to town. The hogs Will bought are dying. I worked till late bed-time on my rug. I have it nearly done.